As I mentioned before, DS2 is starting a new History Guide on US and World History. I am in the process of pre-reading the assigned literature not only to be aware of what he is reading and be ready with help if needed, but also because I have never read any of these books before - my own school career, like that of many, was marked with dry as sawdust textbooks where great times and people and events were watered down and condensed into a short paragraph or a page that had no life or spark to it, and where my only hope was that it would end soon so that I could go and do something - ANYTHING - else. So, at 40 I am reading Uncle Tom's Cabin for the first time in my life and it is nothing at all like I ever heard or thought it was. I'm only half-way through so will save any comments until the last page is read, but today I read the book which it is said Mrs. Stowe based Uncle Tom on - The Life of Josiah Henson, Formerly a Slave Now an Inhabitant of Canada, as Narrated by Himself. Published in 1849 it is a small but powerful read. (You can read it on-line : http://docsouth.unc.edu/neh/henson49/henson49.html) I was particularly touched by this passage - it brought me to tears after reading the trials and tests that Josiah had gone through and I was able to share in his praising of a most amazing LORD because of the trials and tests in my own life. Scripture is timeless, as are the uplifting hymns from ages past - and it is overwhelming that hearts in the 1st century, 16th century, the 19th century, and the 21st century can all join with the Psalmist in saying "Bless the LORD, O my soul; and all that is within me, bless his holy name!" **It so happened that one of my Maryland friends arrived in this neighborhood, and hearing of my being here, inquired if I ever preached now, and spread the reputation I had acquired elsewhere, for my gifts in the pulpit. I had said nothing myself, and had not intended to say any thing, of my having ever officiated in that way. I went to meeting with others, when I had an opportunity, and enjoyed the quiet of the Sabbath when there was no assembly. I would not refuse to labor in this field, however, when desired to do so; and I hope it is no violation of modesty to state the fact that I was frequently called upon, not by blacks alone, but by all classes in my vicinity, the comparatively educated, as well as the lamentably ignorant, to speak to them on their duty, responsibility, and immortality, on their obligations to their Maker, their Saviour, and themselves. It may, nay, I am aware it must, seem strange to many that a man so ignorant as myself, unable to read, and having heard so little as I had of religion, natural or revealed, should be able to preach acceptably to persons who had enjoyed greater advantages than myself. I can explain it, only by reference to our Saviour's comparison of the kingdom of heaven to a plant which may spring from a seed no bigger than a mustard-seed, and may yet reach such a size, that the birds of the air may take shelter therein. Religion is not so much knowledge, as wisdom;--and observation upon what passes without, and reflection upon what passes within a man's heart, will give him a larger growth in grace than is imagined by the devoted adherents of creeds, or the confident followers of Christ, who call him Lord, Lord, but do not the things which he says. Home again, home again, home we are. How wonderful it always is to come home. We were out of town, actually we went home - where we are both from and where both sides of our families live, for the funeral of my husband's cousin who was tragically and accidentally killed a few days before his 52nd birthday. We were down for two nights and were able to catch up with family that we don't get to see very often, see both Moms/Grandmas for Mother's Day, as well as spend some time swimming at the hotel ( a small secluded pool that is always empty ) and seeing a few of our favorite shows on television since we don't have television at home and only watch videos or dvd's related to school or things we borrow from the library. So sometimes we look forward to going out of town and catching up with Alton Brown, the Meerkat's, and Deadliest Catch. I did get some great cookbooks from my Mom, though. One is a Ladies Home Journal Cookbook from 1960 with a lot of great basic recipes I can't wait to try. I've got post-it notes in several places already. Maybe I'll try and make the doughnut balls in the morning if I feel really ambitious!! The other cookbook is actually the first one I grabbed. With a name like The Prudence Penny Regional Cook Book who could resist? This one is from 1939 and not only has a recipe for Berry Fluff that both son and I found (LOL!!) but it also has one for Opossum, too!! You never know when that may come in handy! Our garden is growing by leaps and bounds - so exciting. Our corn is already 3 feet high, our squash plants are getting bigger by the minute and the beans are doing their best to keep up! The cabbage is coming along nicely, and we've been harvesting the radishes for a week now! My Basil and Lemon Basil are doing great - now I can't wait to plant the Sage, Parsley and Cilantro that I bought, too! This week we'll be working on our projects for the County Fair and I'll be finishing up some other odds and ends. The ASF Walk is fast approaching on Saturday, May 19th. We've never attended and this year one is being held only an hour away. I'm really going to try and go. I think Angel would enjoy it immensely! It's just been a day, or a few days as the case may be, and I have an hundred thoughts going around my head -- none of which will be still long enough for me to put some coherent words together for posting! So, I'll just post some of my random thoughts and hope they make at least a bit of sense. I'm on the last stage of daughter's last dress (the pink one). Waist seam and four buttons are all that's left. Hopefully it will be done before the weekend! I've been working on a cute poncho for my younger granddaughter, when it's done I'll get pictures. I'm giving my mother a 70th birthday party this June and so that has taken a lot of my thoughts recently. It's been a little more stressful than I thought it would be, but in general all is going well. She finally gave me the guest list which put me into action on making the invitations! This is a rough draft, if you please. 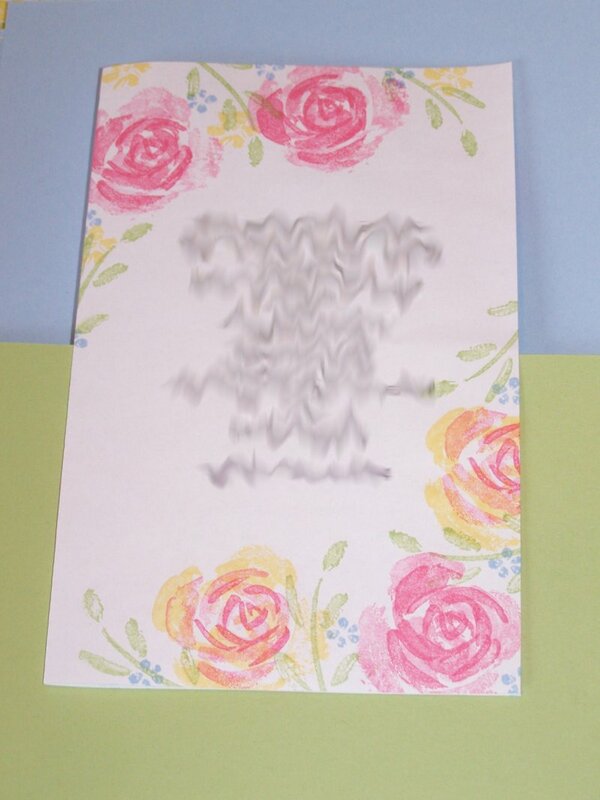 It's made with the Roses in Winter set from Stampin' Up!, which is not only beautiful but extremely versatile. This is the design I'll be using - I think I like the color combinations and the weight of the three roses on the bottom. It will be mounted on the blue cardstock at the top. 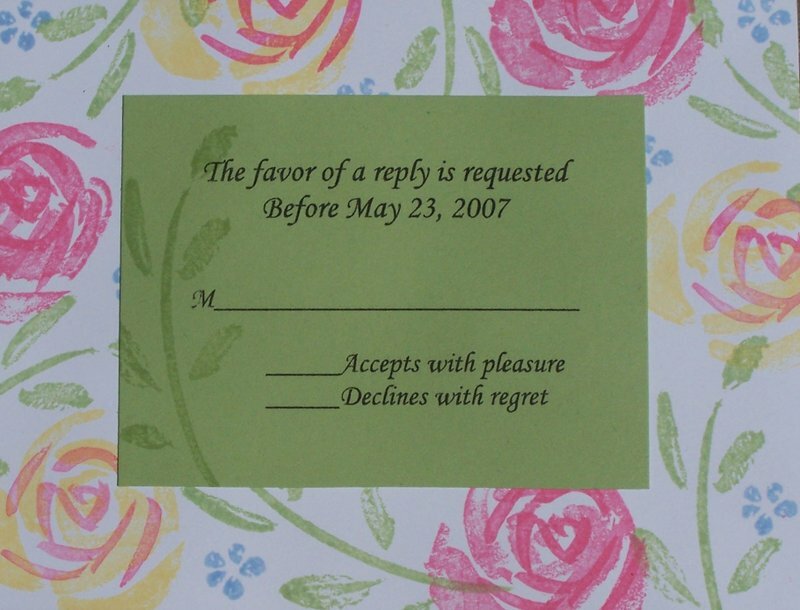 I've already made the RSVP cards, which are just the opposite of the invitation, almost. I printed them on the green cardstock at the bottom of the picture and mounted them on white cardstock stamped with the roses. When I'm all finished with them, I'll get a photo for posterity! Our little garden outside is doing well, and not so well. The corn is taking hold and growing, as are the radishes and carrots, in spite of the fact that the dogs think the planter boxes are there for them to practice their hurdle jumps on! My cabbage is coming up beautifully, and the squash and peppers are, too. We need to re-plant the beans, though, and probably the eggplant. For school, we've been learning about colonial history both for this country and Australia. We read about Jamestown colony today. A few weeks ago, we also borrowed the PBS series Colonial House and Frontier House from the library and had a great time watching them and talking about if we would be able to do that! Colonial would be a bit harsh for me - don't think I could do that. But Frontier House was totally something that we could see ourselves at - even though it would be incredibly hard work from sunrise till sundown. Then as an off-shoot of that, I checked out some books on pioneer/frontier history. They are all letters written by women of the time, to friends and family, describing their experiences. I've started one and I'm looking forward to reading the others as well. Here are some of the books I've discovered: Letters of a Woman Homesteader, Apron Full of Gold, Covered Wagon Women (a Series of 9 books), and Bachelor Bess. On a side note: we've been trying to do without lights in the evening at least a few times a week. As the sun goes down, we get out the candles and will have dinner or do chores, or read by candlelight. It's amazing even to the children that after a while they feel tired and ready for bed. We're all learning how the artificial time created by electric lights really affects us. If the lights are on and we stay busy, it can be 10:00 pm or later before anyone thinks of bed, but with the candles glowing we're all ready to get in bed before 9:00pm! It's pretty interesting. 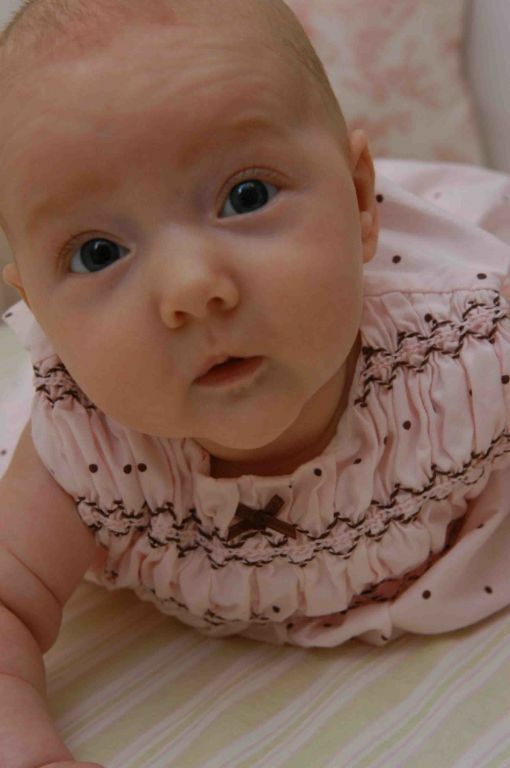 Here's a picture of sweet little baby K that I made the blanket for. My niece sent it today, along with some great pictures taken with K's big brother! Isn't she irresistible? I experimented this morning with our breakfast. I had lots of ripe bananas to use and was planning on Banana Bread, but have been having a hankering for Pumpkin Bread. What to do? Combine them of course! I compared the recipes and ended up doubling the Banana Bread recipe, except instead of using more bananas, I added an equal amount of pumpkin! There were some cranberries in the cupboard so they went in -- and husband doesn't think it's really a quick bread without nuts - in they went, too! What did we end up with? The most delicious Banana Pumpkin Cranberry Nut Bread!! Really! We all agreed that it was excellent - not too banana-y and not too pumkin-ny, either. The perfect blending of the two. Oh!! But I did want to point your attention up to the list on the right of Posts I've Enjoyed from other blogs. If you have a few minutes, check out some great writing and tips - at least ones that I found helpful for my own life.